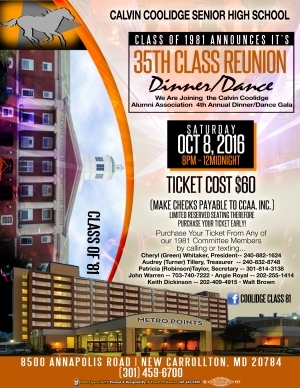 The CCAA Class Reunion page provides reunion annoucements and tools to help your class committee plan a successful reunion. Provide your committee with a CCAA domain (committee19xx@cchs-aa.org) email distribution list to facilite communication between your commitee and your classmates. Create a class Photo Album on the alumni website. We will scan your class senior pictures to the photo album. Classmates can also upload pictures from their high school years. "REUNION PLANNING 101" This booklet will provide your commitee everthing they need to plan your class reunion. The booklet includes both timlines and forms to help you plan a successfull Class Reunion. 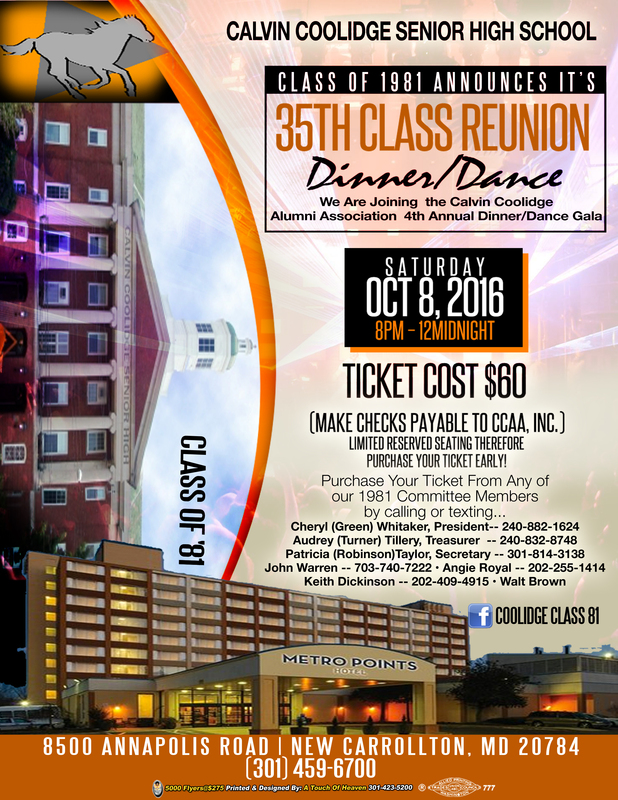 The class of 1966 are finalizing plans for their 50th Class Reunion on November 11-13, 2016 at Martin's Crosswinds, Greenbelt, MD. Hello to the Mighty Coolidge Class of 1975! CELEBRATE LIFE, THE BEFORE, THE PRESENT, AND THE HERE AFTER! GO COLTS!! Here’s an optional event for our 40th Class Re-Union, Remember our class trip 40 years ago which was to the Bahamas. We are attempting to upgrade at a very economical cost using Frank Jones’s Shareholders Benefit. Please click the link below for details for details! THANKS! !